This relatively unknown Island, which is actually a long "Key", is the perfect spot for girlfriend getaways, Florida family vacations or romantic weekend getaways. We dicovered this gem after my parent's took a vacation here and loved it so much they bought a winter getaway home. 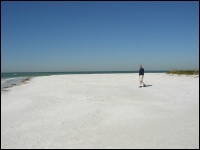 The island is comprised of....from north to south....the city of Anna Maria, Holmes Beach and Bradenton Beach. Here is why you will love this narrow, peaceful island for your Florida getaways! Check out Anna Maria Beach Rentals, other lodging on Anna Maria and Bradenton Beach accommodations, including beach rentals, Florida bungalows, motel and B&B. There are many interesting restaurants on the island and also Bradenton Beach. Looking for a great getaway for girlfriends? AMI has plenty of shopping, activities, the arts, day spas and gorgeous beaches for relaxing! There are LOTS of shops and boutiques to check out on the Island. Great activity for a rainy day or Florida girls weekend. Bayview Plaza - Across from the Anna Maria Island City Pier. Holmes Beach Shopping Center on Marina Drive. AMI Center on East Bay Drive. Ride the free Trolley and shop around the whole island. Also, check out the fun Red Barn in Bradenton - This is a huge flea market and indoor market. Acqua Aveda on the Beach - Winner of the People's Choice Awards for Best Day Spa and Best Hair Salon, 15 different types of massage and body treatment, many different kinds of facial treatments, nail care and even vacation packages. Body & Sol Spa and Wellness" - Anna Maria's largest day spa offering massage, skin care, waxing, nails, makeup, hair, yoga classes, acupuncture and more. Island Players - See a play at this great little theatre. Artist Guild Gallery - Holmes Beach Shopping Center - Local Art and Photography. AMI Community Chorus and Orchestra. Shelling - Go at low tide and try Bean Point at the Northern end of the Island on Anna Maria Beach. Tennis - Public tennis courts North of Holmes Beach City Hall. 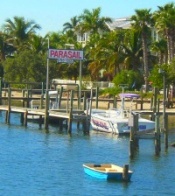 Parasailing - For the daring and adventurous - Fun N Sun Parasail 941-795-1000 and Yolo Parasailing 941-792-6000. Florida Water Sports - 941-798-3721. Ultimate Power Sports - 941-761-7433. Scuba Diving - Sea Trek Divers - 941-779-1506. 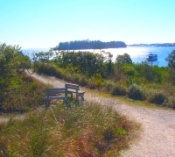 Bay Walk - Take a hike here, on the Southern end of Anna Maria Island across from Coquina Beach. Paths curve through the nature area with great views and bird watching. Scooters - Rent a scooter to explore the Island - Island Scooter Rentals 941-726-3163. 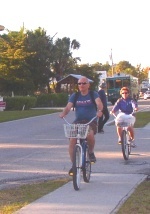 Biking - Anna Maria is PERFECT for biking....it's flat, sidewalks and quiet side streets. Rent bikes - Beach Bum Billys' - 941-778-3316 & Island Scooter Rentals - 941-726-3163. The Rell Crazy - 941-792-6065. Dream Catcher Charters - 941-794-5765. Uncle Mudfish Charter - 941-238-8925. Mahina La Sailing Adventures - 941-713-8000. Capt. Kathe & First Mate Pup-Pup - 941-812-3241. Coldest month - January with an average high of 72 degrees and average low of 51 degrees. Warmest month - July with an average high of 91 degrees and average low of 73 degrees. Driest month - April with average of 1.83 inches of precipitation. Wettest month - August with average of 9.43 inches of precipitation. Share your Anna Maria Island memories with us! Have you been to Anna Maria Island or are planning a trip? We would love to hear from you! Share your best tips, reviews and stories here. You can even add your favorite photo.